Beauty Rides A Hero Honda: Ram Ram Chennai! Okay, that may be a little bit of an exaggeration. It’s more apt to state that it’s where a different parts of India have come together to produce a uniquely Tamilian cocktail with intriguing Gujurati and Rajasthani aftertastes. It's not just old women who you’ll see walking about in colorful, traditional north Rajasthani and Gujurati clothing and jewellery here. Slender women with faces fully veiled and wearing lehenga choli walk past in groups with babies perched on hips, as light-skinned 20-somethings in more conventional sarees zip past side-saddle on the back of mopeds or scooters. 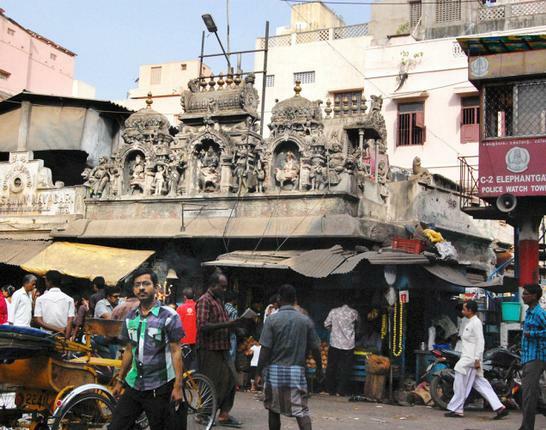 Out of Tamil Nadu and into the heart of what could be the most tradition-bound neighbourhoods of Jodphur or Bhuj within just a few minutes’ walk of Chennai’s main rail station. Even many of the store signs and name boards are in Hindi or Gujarati scripts. Mint Street itself derived its name from having housed the East India Company's mint. These days, many people visit the area to sample the tasty bites on offer, which hail from all over India. Snack on chaat or crispy jalebis. Try out different flavours of kulfis and sample pyaz kachori. How about paani puris or a 'murukku ' sandwich? Take some chotu motu bhel, raj shri paani poori, sinabhai idlies, novelty pau bhaaji, aloo sabzi, bhindi, raita, shahi panner or Kolkata paan. But these are not the only Indian ‘reality bites’ around here. And as one hundred diesel powered generators along Mint Street and beyond power up to spew out their pollutants for the duration of the latest power cut (euphemistically called ‘load shedding’ here), little surprise also that one-third of India's households do not even have electricity to power a light bulb, according to the 2011 census.